Take care of yourself first. It’s neither a new nor radical concept. If there happened to be an emergency while flying, procedures have us placing our own oxygen masks first, before assisting others. Why? If you run out of air, you can’t help anyone else. While it makes sense, how many of us apply similar rules to the rest of our lives? If you take care of everything and everyone else first, you may be setting yourself up for health and emotional problems, including stress, reduced effectiveness, fatigue, sleep issues, frustration, and resentment. In this holy time for Jews and Christians, it’s appropriate to remember Jesus’ second commandment, “Love your neighbor as yourself.” (Matthew 22:39) Love yourself so you can love others. Take care of your own needs, and then attend to family and friends. Air is essential to the body, and so love is necessary for emotional well-being. Start with loving and taking care of yourself first. If Jesus ‘ teaching doesn’t resonate, then think of self-care in terms of sustainability, a term more often associated with the environment. Sustainability means living in harmony, recognizing limits, and the ability to continue with minimal long-term adverse effects. If you were always spending your money and not just the earnings from investments, ultimately, nothing is left. 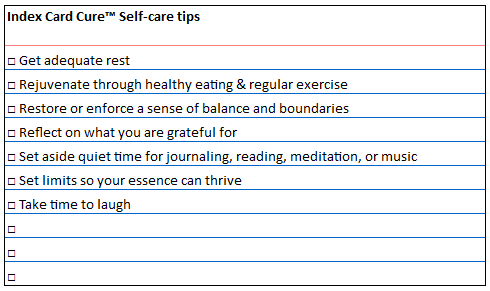 So it is with self-care. If we want to continue in good health, we must keep our essence intact and give from what we can spare without harming ourselves. We’ve been instructed by a master teacher to take care of ourselves. You have permission. Be diligent about asking for what you need and maintaining boundaries.